Indians are going to choose their government and two leaders are gaining a lot of attention. One is Mr. Narendera Modi and the another one is Mr. Rahul Gandhi. Among these leaders, there may more interest in Mr. Rahul Gandhi’s political future. We all know that the Congress party had a pathetic fall during the 2014 elections. At the same time, the Congress party has grown after their setbacks in the previous elections. No one doubts the capability of Mr. Modi and BJP, yet, people will have anxiety to know whether Rahul will be able to lift his party’s flag as a ruling party? Is he that capable to make a difference in the political arena? Remember, he is one of the most underestimated or bullied politician in India. There is active propaganda going against Mr. Rahul Gandhi, that he is an incapable person. When we see Rahul, it is sure that he has a lot of progressive changes. It will be very interesting to study his astrology chart, to know what it says about Rahul as a person and as a politician. Our astrology chart has 12 divisions, these divisions are called houses. These houses are ruled by signs. 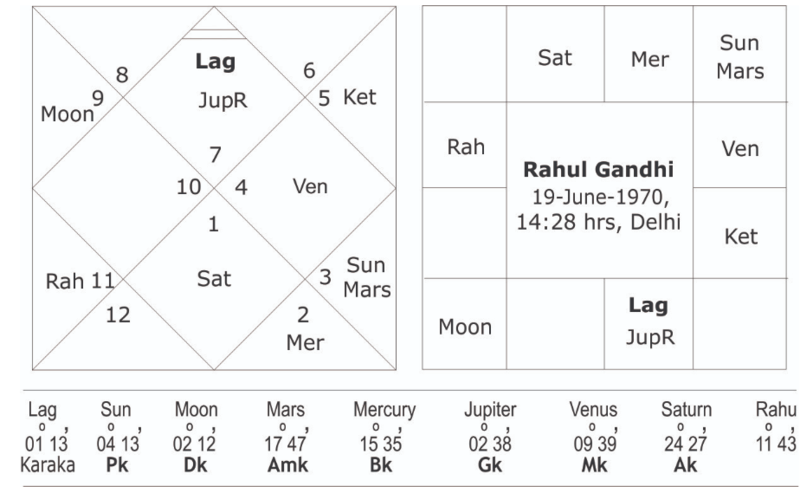 In Rahul’s chart, the 1st house of personality, Lagna, is also ruled by Libra and he has a Jupiter in it. Libra is ruled by Venus and this planet is in a good placement, so it is clear that he will be always having a luxurious and rich life. Jupiter in his Lagna is in a retrogression mode, even though there is divine protection for his life, there are challenges to overcome. This Jupiter is the ruling the house of enemies and it has gone into the house of personality means throughout his life his enemies will try to tarnish his image. The house of enemies, which is the 6th house is ruled by Pisces, Pisces itself indicates hidden enemies. The 6th house also indicates co-workers, so we have seen many people from Congress moving into BJP in different states. He may have to carefully deal with his co-workers. Now you will be curious to know, whether Rahul can be an active politician. Yes, he can surely be an active Politician as his lord of personality is in the house for a career. He will always be in politics. But there will be a lot of fluctuation in his career as the planet which rules the career, which is Moon is in the house of turbulence. This is a special feature of Rahul Gandhi. What is Kemdrum Dosh? For that, we have to understand what Moon indicates in astrology? Moon indicates mother, mind, brain, intelligence, good behavior, and emotions. If Moon is weak, then the person will have a weak mind and that may delay his progress. Rahul’s Moon is not supported by other planets in the left and right houses. This situation is called Kemdrum Dosh. It happens when the Moon doesn’t have any planet on either side. Such people will take a long time to develop their personality. Once they are fully bloomed, then they will come out as a very powerful person. 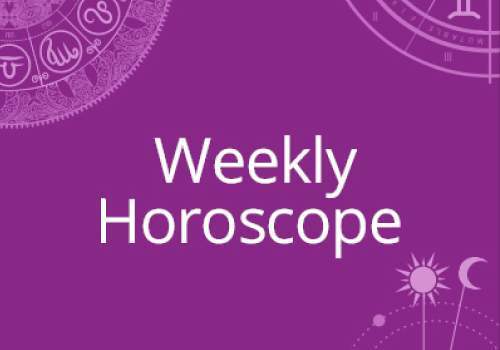 Rahul’s Moon is also in a negative house and influenced by fiery planets, the Sun and Mars. So, this chart is showing a lot of stress. 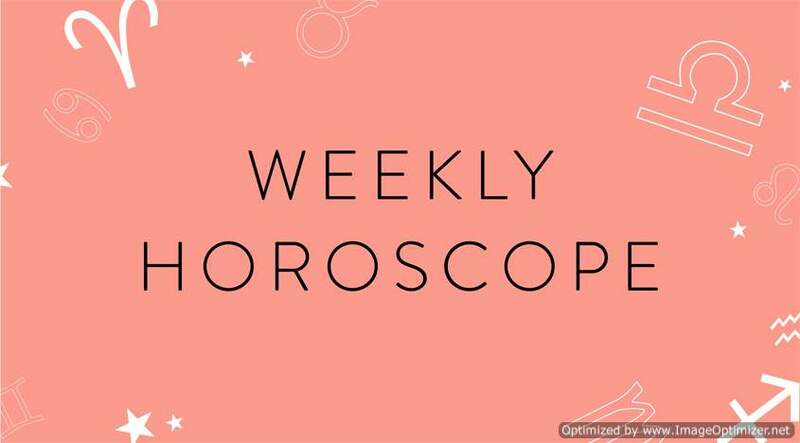 Any negative issues in any one’s chart are just until the mid-forties, then the person will surely get over it. Now Rahul has overcome those struggles by 85%. He will be growing more in wisdom and strength as the day’s pass by. There will be a lot of positive changes in his chart and he is not at all weak as the people think. He can surely be a strong politician. At the same time, his chart is not that strong as Mr. Modi, but it would be highly unethical to compare 2 people’s chart because they carry different destinies. We all are playing different roles in the universe. He being single is a blessing to him and this is clearly seen in his chart. The house which shows spouse we can see a negative Saturn, and it indicates frictions in marital life or delayed marriage. Being an astrologer, I want to inform that not all have yoga for marriage. We can see a lot of singles out there. If they get into marriage, then their life will have a lot of challenges. So, for some people, it will be good to be single than getting lost in the labyrinth of the relationships. Here Rahul has a very powerful “Neech Bhang Raja Yoga” so there will be some strong woman in his life who can inspire him. In the coming days, his Neech Bhang Raja yoga will gain more strength. Remember our PM. Mr. Modi also has a very powerful Neech Bhang Rajayoga as well. Rahul was going through the dasa of Mars and during that dasa he revived Congress party. Now he will be going through Rahu dasa. Rahu is rightly placed in the 5th house of politics, ancient sciences, teams, groups, children, and romance. He has just entered a new dasa, so, there will be small issues during the coming days, but ones when his Dasa speeds up, then you will be a lot of progressive changes in his life. His chart is very rich with so many dhan yogas and Raja yogas, but the planets which show such yogas are little complexly placed, so they will take some time for the fruition. They don’t deny the dhan and rajayogas. He has Vipreet Rajayoga as well. This chart belongs to a person who takes time to progress through the time, but progress is sure. Jupiter in lagna, even though in a retrogression mode showing the goodwill for the people. Jupiter is the most benefic planet and when it is lagna it shows, this person is more towards the positive side of thinking. His Rahu is very powerful and there will be progress in his career as a politician. However, it is very difficult to say whether he will become the Prime Minister, but the chances are not bleak as his enemies say. He will the always as a politician and that’s is for sure. This Rahu dasa is a game changer for Rahul as, during Rahu dasa, any person will break the chains and comout as a rebel. This nature will be good for Rahul because people will see a different person in him. He has already made plans and back up plans in a futuristic mode. So, the conclusion is Mr. Rahul Gandhi, do have the chances to be a very strong and efficient politician. He will always be in active politics, but even by looking at Mr. Modi’s chart, it is not possible to say whether this person will become the PM, but we will come to know that he will be a powerful politician. Same with Rahul, looking at his chart we can never say whether he will be PM, but it is a clear fact that he has a great role in Indian politics and his destiny supports that unlike his enemies underestimate him.